What makes a better gun belt? Building a better gun belt starts with materials used, but there is so much more. If you've done much searching for gun belts you've seen pictures like the one below. I made this belt for myself as a NON carry belt, so I feel it's okay for me to point out it's failings as a gun belt. Like many belts featured on the web, it's wound up like a pretzel. That means it is fairly soft. This is not necessarily a bad thing. It might do a great job of holding up a sub compact pistol IWB style, but NO WAY this belt will carry a full size pistol OWB style sufficiently. The buckle - Well it's wrong and it's right. You either love it or you hate it. If you love it, great! A roller buckle will help to keep your belt looking new for a very long time. If you hate it, it's easy to change out. Now lets take a look at what makes this better than the ordinary handcrafted belt. This Edge - Notice the rounded (and smooth) edge. A nicely rounded and correctly burnished edge will last for a long time. You can't tell this by looking, but it is very important to dye the edge before you burnish the belt. Dying or painting the edge after burnishing will result in the dye rubbing off or the paint peeling/flaking off. This is a common mistake among gun belt makers. Squared Edge - Some belt makers do not bevel or burnish their belts. Brand new, they look fine, but the corners will wear quickly and make your new belt look ragged after a few wears. Burnishing is a tedious and time consuming process that some are either unwilling to do, or simply do not know how to do. Look carefully while shopping, some of the best known belt makers are guilty of this. The Keeper(s) - The second keeper is a removable "snap on" keeper, and it comes standard with our Ultimate and Perfect Fit belts. It can be used to hold down excess belt tail and add a classy look, or can be removed. Both keepers are dual layer to better hold their shape, stitched on both sides, edge dyed and burnished. The snap on keeper for free, is specific to A Better Belt USA. Dual layer keepers are rare. Burnished keepers are done by a few belt makers. 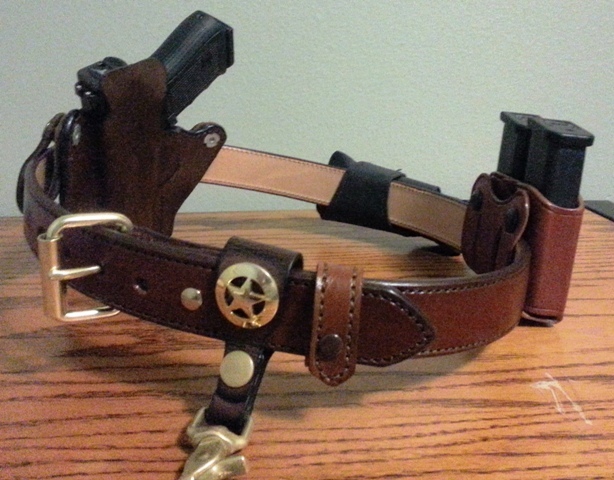 The picture below shows a belt that is stiff enough to carry any size firearm in OWB style. This is our Ultimate Gun Belt with OWB stiffness. As you can see, it doesn't require any help holding up all that gear. Of course we'd love to be your belt supplier, but if you decide to shop with someone else remember to notice the details before you buy! What makes a good gun belt?